Image used under Flickr Creative Commons license from Bureau of Land Management. In our new “Weekend at the Westmark” series, we’ll be taking you all over Alaska and the Yukon to show you an unforgettable weekend vacation at each of our properties. In honor of the “The Last Great Race,” we’re kicking things off at the Westmark Fairbanks Hotel & Conference Center. The 2015 Iditarod Trail Sled Dog Race will officially start in Faribanks on March 9, after the ceremonial start in Anchorage on March 7. The race’s usual restart destination is in Willow, but the Last Frontier’s ever-unpredictable weather conditions had something else in mind for 2015! Due to record-warm temperatures in the Southcentral part of the state, the official start has been relocated to Fairbanks for only the second time in history. The 9th falls on a Monday, so book a room this weekend and make the most of all the Golden Heart City has to offer! 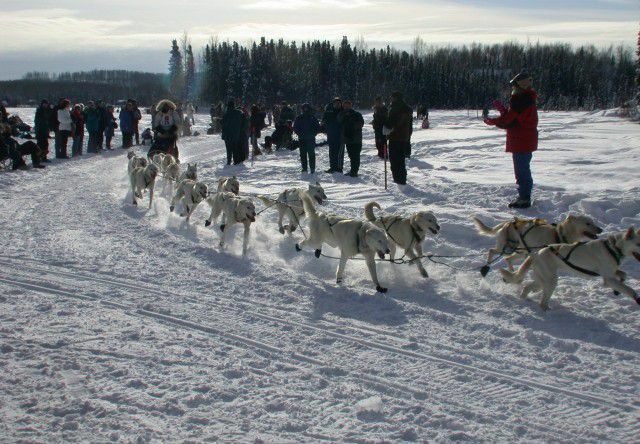 With milder temperatures and increasing daylight, March is a great time for a winter trip to Fairbanks where there is no shortage of exciting activities. Be sure to check out the World Ice Art Championships, now happening until March 29. You’ll be able to peruse some of the finished sculptures from the single-block and multi-block competitions right after their completion, which is optimal timing as they’ve had less opportunity to begin melting. The sculptors come from all over the world and each year the results are astounding and intricately beautiful. You can even take an ice-sculpting class yourself from one of the best ice artists in the state. For an evening out, stop in at Hoodoo Brewing Co. for a pint, or even a growler to take home! It’s locally owned and operated by a world-class brewer who trained and studied all over the world before returning to his hometown of Fairbanks to build a brewery of his own. This place is a great go-to for the perfect taste of Alaska. Don’t forget about the northern lights during your weekend of fun — at the Westmark, you can set an aurora wake-up call and a hotel staff member will notify you, day or night, of any auroral activity. Seeing the northern lights is never a guarantee, but on a clear, dark winter night in Fairbanks, your chances are as good as they’ll ever be. You might be signing up for a 2 a.m. alert, but you’ve got tomorrow to sleep in, right? Finally the event you’ve been waiting for, the Iditarod start on Monday. Bundle up and head to Dale Road near Pike’s Landing restaurant and watch more than 70 mushers take off for the competition of their lives. We’re sure this is a weekend trip you won’t want to miss!